Evanston’s unemployment trends have remained more stable than surrounding cities, which local economic officials said can be attributed to higher education levels and the jobs provided by Northwestern. The Illinois Department of Employment Security released data showing that unemployment rates increased in the past year throughout all Illinois metropolitan areas, rising from 6.0 percent to 6.6 percent in the Chicago metropolitan area and from 6.0 percent to 6.8 percent statewide. 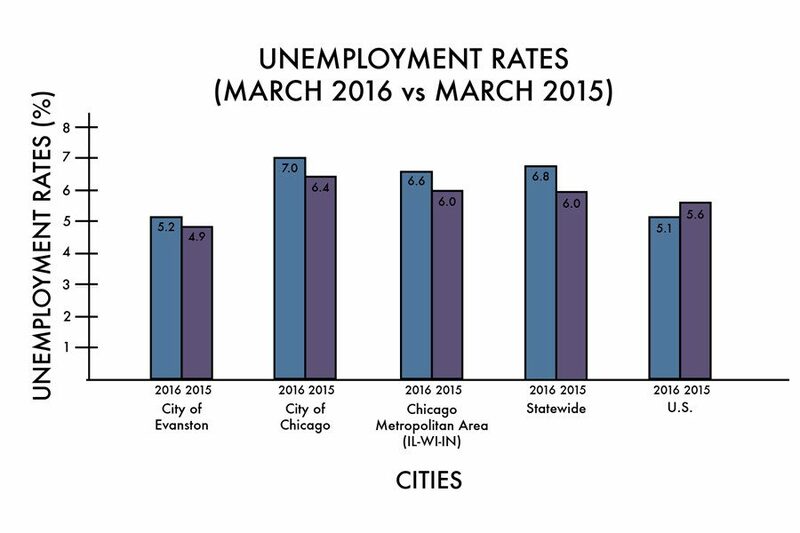 However, despite the rises in the Chicago metropolitan area, Evanston’s unemployment rate has remained much lower than the state and regional rates, currently sitting at 5.2 percent. Although Evanston’s unemployment rate increased by 0.3 percentage points in the past year, the difference was smaller than other nearby increases, such as the 0.6 percentage points increase in Chicago and the 0.7 percentage points increase in Skokie. The national unemployment rate is 5.1 percent. Evanston economic development official Paul Zalmezak said NU’s position as a major local employer is one factor that makes the city’s unemployment rate closer to the national average than the rest of the state. Outside the University impact, Evanston’s white-collar workforce is able to withstand more fluctuations in the labor market than other cities with a different business sector makeup, Zalmezak said. IDES director Jeff Mays said in a statement that the increase in the unemployment rate was mostly because more people entered the labor force. “Unemployment rates increased in more than half of the metro areas even though they experienced job growth,” Mays said. Total non-farming jobs increased by about 1.4 percent throughout the state in the past year, according to the IDES data, and by 1.8 percent in the Chicago area. However, any job growth in Illinois is still making up for the large loss in jobs during the 2008 recession, where the state lost more than 400,000 jobs. While recovering, the state still has fewer private sector jobs available than it did at the turn of the century, according to a survey by the Bureau of Labor Statistics. Statewide, industries such as manufacturing continue to struggle to regain jobs since the 2008 recession, said Sean McCarthy, a state official from the Department of Commerce and Economic Opportunity said. In March, 100 manufacturing jobs were lost in the state, McCarthy said. “That’s 100 middle-class families every single day facing the financial stress, hardship and uncertainty of losing a well-paying job,” he said.